Why hello there, Winter Brides! Being based out of the Midwest, you’d think that we would have had our fair share of experiences with winter weddings, however winter brides have been few and far between. The snow blanketed season is seemingly the least common to get hitched in, likely due to the weather’s unpredictability or as we’ve heard before, “feeling limited in creative ideas”. The white dusted landscapes can offer a pretty magical backdrop - not to mention the benefit of off season rates! Let us embrace winter weddings with arms wide open (and covered in lace) ! We are lovers of long sleeves, always classic and effortless, we happily add lace sleeves to any of our linyage styles which is a must for winter brides. Choosing a full skirt style will give you extra layers to keep you cozy, not to mention it hides a pair of fleece lined leggings perfectly! No joke - we are 100% on board with hidden layers, your guests will never know! On to accessories... A pair of redwing heritage boots are practical for traversing the landscape, keeping your toes warm and a great way to accessorize your look. We love the idea of trading in a veil for a gorgeous wool hat topped off with fresh blooms - a unique idea that will also add warmth. We are all about thinking outside the box when it comes to florals for a winter wedding. The muted green hues and natural tones mixed in with pops of color create a delicious, and unexpected color palette. The white landscape is your blank canvas and allows room for creativity when choosing blooms. 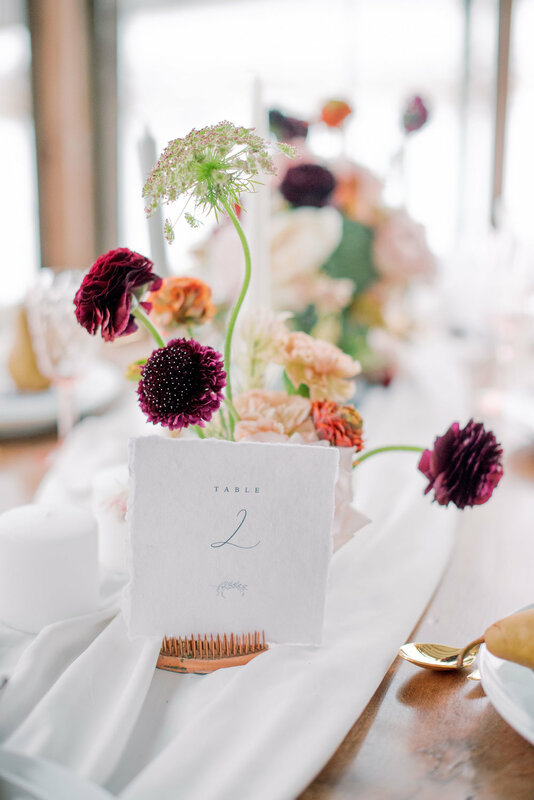 Gone are the days of only using red and black on snowy wedding days; bring in touches of nature by mixing elements - you are allowed to create your own color palette! Mixing patterns and textures in the men’s attire, like our friends from Heimie’s did here, lend some great depth to an otherwise monochromatic backdrop. Remember, grooms can have a moment, too! Can we please take a second for natural light? Just because it’s winter and that much-coveted golden hour may not be as present as a july evening would give, the reflection of light off the snow –– overcast or sunny–– can really cast a lovely glow. The recent glass barn addition to the enchanted barn venue has hit all the marks on that, creating a cozy, intimate setting with light pouring in, while being able to avoid some chilly temps. Be inspired by non traditional locations for your big day and think outside the box! 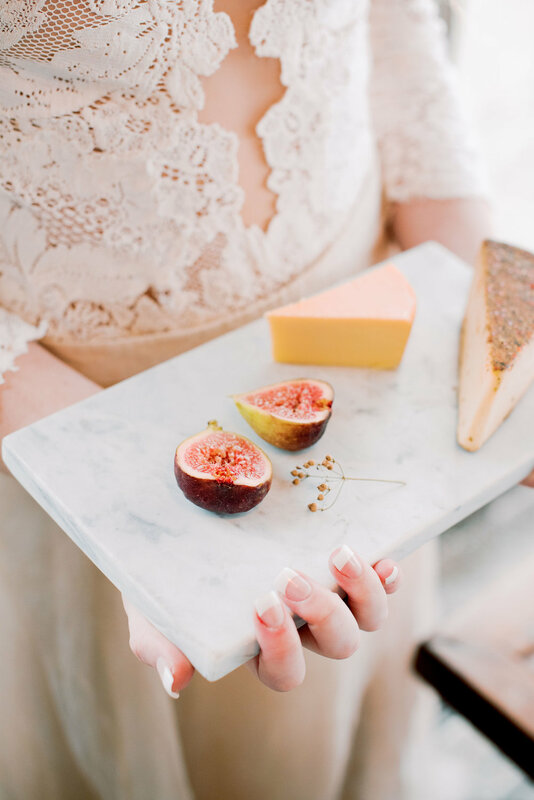 The outside bride recently shared the full story behind this shoot and the wonderful lineup of vendors that make it all possible.